One of our favorite practitioners and psychic readers, the famed Mambo Michele! Mambo Michele is a native of New Orleans reared in the Seabrook area of Gentilly Woods. She holds a Bachelor of Arts in International Relations with an emphasis on Latin America and the Caribbean from Agnes Scott College in Atlanta. Mambo Michele has traveled extensively throughout the world and lived in Guatemala and Mexico for several years prior to her relocation back to New Orleans! Michele deep spiritual connection dates back to when she was a young child and was particularly drawn to the Caribbean and South American religions, cultures, literature and languages (we now know why). While residing in Mexico, Mambo Michele traveled to Haiti to initiate into Haitian Vodou at the rank of Sur Pwen in July 2000. 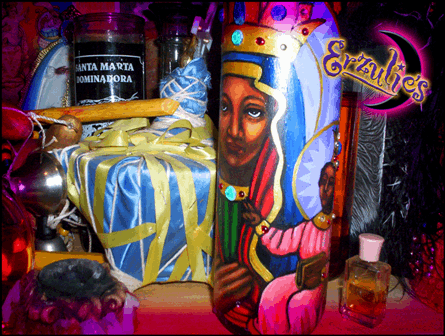 After returning to her home in New Orleans, she traveled to Haiti in October 2001 to re-kouche at the rank of Mambo Asogwe (the highest rank in the Vodou priesthood).